QueenOnline Message Board • View topic - Brian May/Kerry Ellis album "Golden Days"
Brian May/Kerry Ellis album "Golden Days"
Maybe he's getting a Nintendo Switch. Some more tour dates with Roger and Adam? Rescheduled dates with Kerry or an album announcement? Something to do with the Queen 3D book? The movie? BitterTears wrote: ...on Friday morning. My money is on official announcement of either Anthems II or Freddie Biopic. Maybe Brian May solo box? Re: Brian May/Kerry Ellis album "Golden Days"
No big surprises and kind of like Roger's Fun On Earth more of a compilation of the last few years. SO that leaves us with 4 "new" tracks...kind of. Golden Days is obviously the Minako Honda track Brian wrote and produced a while back - he mentioned in on his twitter/soapbox at one point - so again no surprise. Turned out to be very early on Friday morning. I note that this isn't a Kerry Ellis album produced by Brian like Anthems, this is credited to 'Brian May & Kerry Ellis' this time. and per the press release I was correct to see it was the Benny Andersson track...but the first track is a May/Ellis composition and the Panic Attack is a May composition. I had a winge about how bad Brian's version of "Parisienne Walkways" sounds in the Air Guitar thread, but I'm still vaguely interested in this. I keep meaning to pick up their first but never seem to get around to it (can't say I'm a big fan of musical numbers). 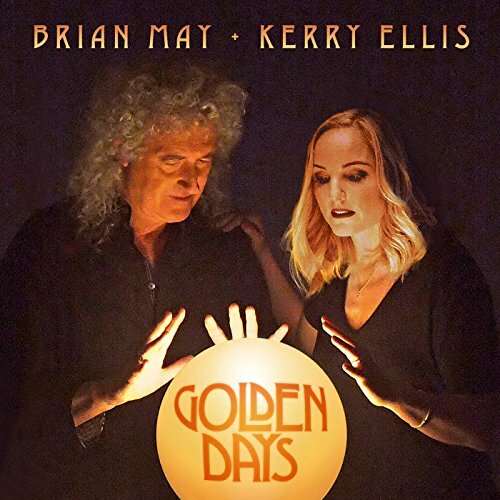 Brian May/Kerry Ellis New Album "Golden Days"